PCE inflation is going to decelerate. It will face tough comparisons in the next few months. These include slowing global growth and housing price growth. Also, commodity prices are falling. The Bloomberg CRB commodity ETF is down 5.56% year to date. Headline PCE inflation was up 0.2% month over month in October. This met estimates and was higher than the 0.1% growth rate in September. Year over year headline PCE inflation was 2%. That missed estimates for 2.1% growth. It was the same as the 2% increase in September. 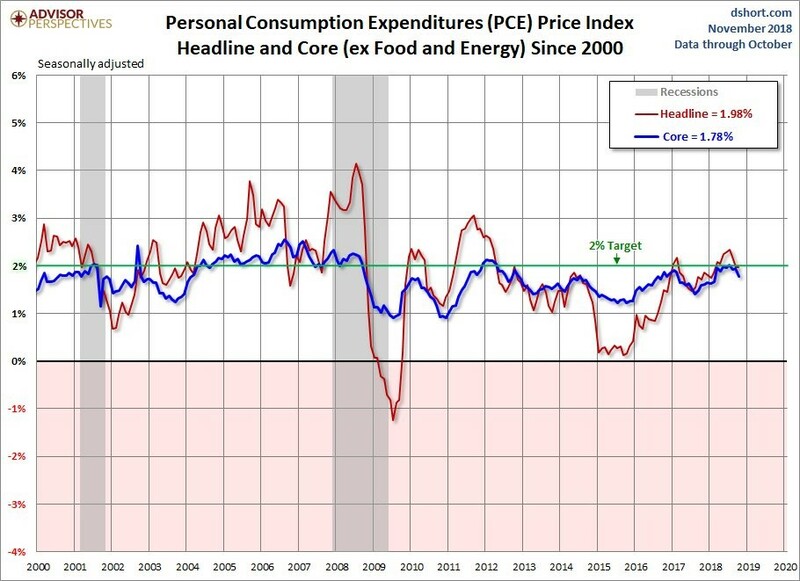 As you can see from the chart below, headline year over year PCE inflation peaked in July 2018 at 2.34%. That's near when economic growth peaked. November’s comparison will be tougher as year over year headline PCE went from 1.71% to 1.87% in November 2017. It fell the next 2 months and then ramped higher until this July. The Fed’s principal concern is core PCE inflation. On a month over month basis, it was up 0.1% which missed estimates for 0.2% growth. It met growth in September. On a year over year basis, it was 1.8% which missed estimates for 1.9% growth. The September result was revised from 2% to 1.9%. When you exclude rounding, the decline in year over year core inflation was steeper. In September it was 1.93725% and it October it was 1.77744%. That’s closer to a two tenth decline than one-tenth. The big year over year challenge will be in March 2019. Year over year core inflation went from 1.66% to 1.96% in March 2018. Now that core inflation isn’t at the 2% goal anymore, you would think the Fed would back off from rate hikes. We’ve seen the Fed hike rates with inflation falling in 2017. However, now economic growth is falling, so the Fed has an additional reason to pause rate hikes. It will still hike in December. More importantly, there’s very easy justification to lower the guidance for 2019 hikes.